In politics, as in life, where you stand depends upon where you sit. Recent polling I have conducted demonstrates that what people believe to be true about the political world is in large part a function of whether they are a Democrat or a Republican. Last month the Pew Center for the People and the Press conducted a poll which found that almost 20 percent of Americans mistakenly believe that President Obama is a Muslim, and another 43 percent cannot identify his religion. Recently released polls by Time and Newsweek confirm the prevalence of this false information. These findings have sparked a flood of analysis. Some commentators have rightly pointed out that large numbers of Americans believe a number of crazy things. For instance, according to Gallup, 18 percent of Americans believe the sun revolves around the earth. Others have argued that Republican politicians and conservative media sources have helped perpetuate the myth of Obama's religious identity. Recent polling I have conducted seems to support the latter view. 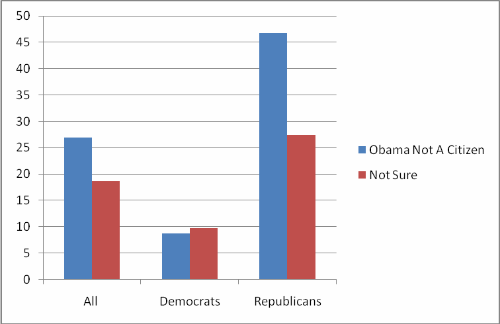 There is a strong political component to misinformation about Obama's beliefs and identity. But politically motivated misinformation is not limited to Republicans. Some Democrats are quite willing to believe false information about Republican politicians. The politics of misinformation, it seems, is not so much a product of direct reactions to Obama as it is to the polarized nature of the current political times. At their heart, questions about Obama's religion are critical because they are tied into broader questions about his character and ability to lead. As part of a larger project on the political consequences of misinformation, I measured belief in another controversy that gets to heart of Obama's identity as an American - whether people believe that he is a citizen of the United States. I contracted Polimetrix/Yougov to conduct a national internet sample of 800 Americans, from July 8th to July 15th, 2010. I asked, "Do you believe that Barack Obama was born in the United States or not?" Consistent with other polls on the "birther" controversy, I found that 27 percent of respondents said that Obama was not born in the U.S. and another 19 percent did not know if he was or not. These findings paint a picture that is similarly unsettling to the Pew polling - misinformation about Obama's national and religious identity is pervasive. My results raise a number of important questions. One question is whether some people are simply ignorant about politics - as they are about other aspects of the world (as the Gallup question mentioned above would suggest) - or if instead the uncertainty about Obama's background is politically motivated. To adjudicate as best I could between these two explanations, I asked a follow-up question of those people who said that Obama was not born in the U.S. or were unsure about where he was born. Specifically, I gave them a multiple choice question: "Where do you think Obama was born: Indonesia, Kenya, The Philippines, Hawaii, or some other place." I picked this multiple-choice question rather than an open-ended question in part because it was easier to ask the question this way, but also to see how the story dominant among "birthers" (Obama was born in Kenya) fared in relation to other possibilities, including one that could be derived from general ignorance (Hawaii was made a state in 1959; Obama was born in 1961). The vast majority of these respondents subscribed to the dominant conspiracy story, choosing Kenya as Obama's birthplace. Among the 46 percent of respondents who either said that Obama was not born in the U.S. or were unsure if he was, two thirds said he was born in Kenya. This pattern was especially pronounced among those who said that Obama was not born in the U.S. - almost three-quarters of these respondents said he was born in Kenya. There is some evidence that, since the beginning of the year, the story about Obama's citizenship has become clearer. Earlier in the year, in January 2010, I designed the follow-up question described above for inclusion on a survey conducted by Angus Reid Global Monitoring. In that poll, the distribution of beliefs about Obama's citizenship were roughly similar to what they are now - 25 percent said that he was not born in the U.S. and 20 percent were not sure where he was born. However, the follow-up looked very different - only 41 percent chose Kenya (the dominant "birther story"), while 25 percent chose Hawaii (a clear demonstration of ignorance). Thus, over the last seven months, it seems that the "birther" story has become more pervasive. Partisan differences in beliefs about Obama's citizenship also indicate that the uncertainty about Obama's background is politically motivated. Though it has been said before, the difference between partisans in their beliefs about Obama's citizenship is striking. As the data show, the vast majority of Democrats say that Obama was born in the U.S. and a plurality of Republicans say that he was not. Similar patterns emerge when beliefs are broken down by approval for Obama; the President's supporters think he is a natural-born citizen and his opponents do not. Put simply, on the question of Obama's citizenship, where you stand depends on where you sit. 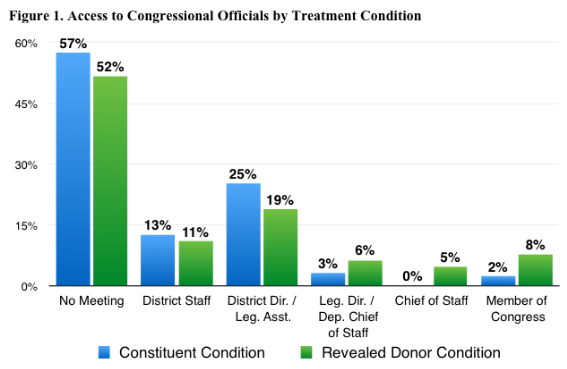 This pattern of partisan misperception is striking and carries over to other political rumors. 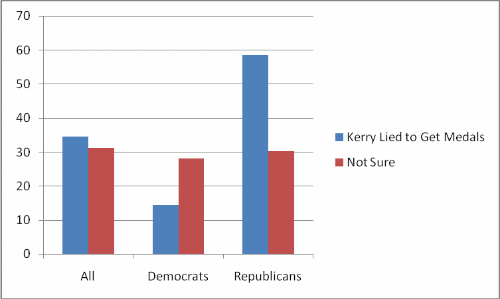 On the July Polimetrix/YouGov survey, I also asked my respondents questions about whether they thought that the changes to the health care system that have been enacted by Congress and the Obama administration create "death panels" and whether John Kerry lied about his actions during the Vietnam war in order to receive medals from the U.S. Army. The large partisan gaps found in the acceptance of false beliefs about Obama's citizenship, not surprisingly, extended to rumors about Obama's policies. But they also extended to rumors about other Democratic politicians as well - a majority of Republicans said that Kerry lied to receive medals and a majority of Democrats said that he did not. The pervasiveness of politically motivated perceptions of reality is not limited to Republicans. On my survey I also asked respondents if they thought that "people in the federal government either assisted in the 9/11 attacks or took no action to stop the attacks because they wanted the United States to go to war in the Middle East." The overall acceptance of this particular piece of misinformation was lower than the Obama citizenship case - 18 percent thought that government officials were aware of the attack beforehand and another 18 percent were unsure - but the accusation here is certainly more severe. What is important for present purposes is that partisan differences in acceptance of this statement were large, as shown in this graph (which has been placed on the same scale as the birther graph above to facilitate comparisons). These same differences do not, however, extend to rumors that are not grounded in partisan politics. 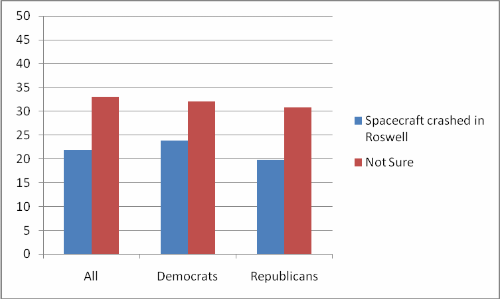 I also asked respondents a question that has been asked on several surveys in the past, "Do you believe that a spacecraft from another planet crashed in Roswell, New Mexico in 1947?" As the graph below shows, the stark partisan differences found on the other questions do not emerge in the case of beliefs about alien life. All these results beg the question of what can be done to correct these persistent misperceptions. The answer is difficult, largely because the incorrect beliefs about politics are as much a function of partisan perceptions as they are about genuine ignorance. Clearly, some people hold false beliefs because they do not pay much attention to the political world. Providing these individuals with greater knowledge of politics might improve the situation. 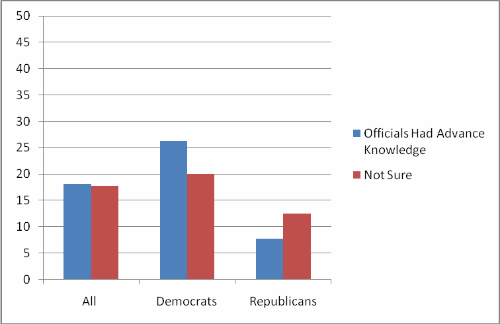 In order to assess the impact of general ignorance, I measured how much my respondents knew about politics by asking them a series of three factual questions about political figures and political processes. The results here are somewhat heartening. I found that the more of these factual questions the respondents got right, the more likely they were to think that Obama was a citizen. Contrary to the findings of some scholars who examined beliefs about rumors concerning death panels, I found that information had the same effect for both Democrats and Republicans. However, the news is not all rosy on this score; even information can only get us so far. There were large differences between the beliefs of Democrats and Republicans at all levels of political attentiveness and even among Republicans who got all three of my factual questions right, 27 percent believed that Obama was not born in the U.S. So what can be done? In a recently published paper that has received a great deal of deserved attention, Brendan Nyhan and Jason Reifler hold out little hope for the possibility of correcting false beliefs. In fact, they argue that providing misinformed people the truth can exacerbate the problem, because these people just cling more firmly to their false beliefs. In a project associated with the Polimetrix/YouGov survey, I have begun to explore other possibilities and I remain hopeful. Still, given the nature of the current political climate, it may be a long road to find a common political reality that everyone can believe in.